Next week, Samsung will finally unveil its eagerly-awaited Galaxy S IV smartphone, and amid all the excitement leading up to that March 14th event in New York City, the leaks are arriving thick and fast. A short while ago, benchmarks purporting to represent the handset appeared to confirm, among other hardware features, an Exynos 5410 quad-core processor and now, the famed and oft-reliant evleaks Twitter account has released a couple of render images of the phone. If the past 24 hours are to be representative of the next ten or so days until Samsung’s launch event, we could see literally hundreds more reports before the official stamp of approval has been given. The benchmarks were followed swiftly by Samsung’s first real teaser clip, which told us little to nothing of the device itself, and with the New York Times also wading into the argument by speculating on a special eye-tracking scrolling feature, it’s somewhat difficult to make head nor tail of what to realistically expect. The renderings from evleaks are certainly of significance, since they actually offers an image on which to pin some of these rumors. We’ve long since expected the quad-core chipset, 1080p display of 5-inches or thereabouts, 2GB of RAM, a 13-megapixel camera, and Android 4.2 Jelly Bean; but glimpses of the device itself have been few and far between. 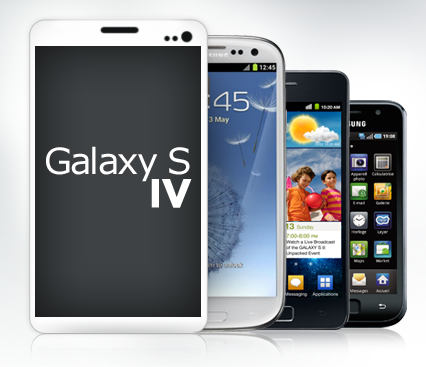 As you can see from the renderings, the Galaxy S IV is set to be the largest to hit the market thus far, but it is quite easy to get a little carried away when the launch event is so close. evleaks has a respectable enough track record for us not to discard this one with the usual pinch of salt, but at the same time, we wouldn’t like to cast any definitive aspersions just yet. And we suspect that these renders are probably the real deal, why? The tweets which revealed these in the first place don’t exist anymore, so we’re guessing there is something big which we can expect. evleaks isn’t the only one crashing the party, Expansys already has a page dedicated to the Galaxy S IV, and, from the looks of it, it’s like they know inside out what the device will look like along with the complete specs. Yes, it will have a Full HD Super AMOLED Display, the Exynos 5 Octa CPU is there, along with a 13MP camera, and our favorite: “Eyes Pause” and “Eye Scroll”. Then again, they’re not the final representation of the device that will hit the market when the device actually comes to fruition. Still, there’s no harm in speculating, and although the suspected plasticity is personally off-putting for me (especially with the likes of the HTC One lurking about), the renders do illustrate a device with an accomplished, high-end appearance relative of its status. The S IV could also arrive in two colors (black and white), and in three different storage configurations ranging from 16GB to 64GB – bringing the total to six different device specifications. We’ll keep our eye out for any further info related to Samsung’s next flagship, so stay tuned to our coverage here at Redmond Pie!